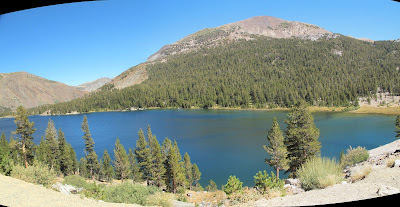 This is a panorama photo I shot of Tioga Lake, from the campground there, at around 2,950m elevation (about 9,650 ft.). The mountain tops are bare because they're above the treeline. The night sky here is beyond spectacular. This is about a 45 minute drive from Tuolumne Meadows in Yosemite Park, at a slightly lower elevation. 2627m elevation (over 8,600 ft.). Nice campground nearby. No showers, though, but you do get flush toilets. And the biggest alpine meadow in North America.